Souls goes sci-fi, with mixed results. What is it? Dark Souls in a junkyard. The Surge opens with a scene-setting train ride straight out of Half-Life while Warren, a brown-haired white male straight out of every video game, heads to his first day of work. He's signing up at future megacorp CREO to be turned into one of their mechanized workers restoring the world after environmental collapse. Then I get control of the camera, spin it around, and realize Warren's not as generic as I thought. He's in a wheelchair. The intro that follows has Warren navigate a train station. The waist-high unpassable barriers third-person action games all have suddenly make sense. It plays out like a walking simulator in which you can't walk, making it plain why this man wants to sign up to be a living bulldozer for a company who seem as trustworthy as Weyland-Yutani. It a bold start, but it doesn’t last. Something goes wrong during Warren's cybernetic upgrade and he wakes up being dragged to the scrap heap, wearing a cyber-rig that gives him the ability to walk, and also fight his way out of this predicament. Something's gone wrong at CREO and he and a handful of other survivors are trapped in an industrial wasteland full of cyborgs turned murderous, and The Surge becomes familiar again. While its first minute was reminiscent of Half-Life and later it made me think of System Shock 2—choosing a career by choosing a hallway, finding audiologs, being guided by a woman sheltering in a distant part of the complex—what The Surge really resembles is Dark Souls. Like Deck13's previous game Lords of the Fallen, it's not so much a love letter to Dark Souls as a delirious tongue bath directed at it. I leave the safety of an Operations room, having upgraded some of the gear plugged into my rig and refilled my injectables, entering the haywire junkyard surrounding it. Malfunctioning workers and drones lurk around corners and fight with deliberate precision; every attack, dodge, or block drains precious stamina. I push on, perhaps getting slightly further than the last time, maybe unlocking a new shortcut back to safety, maybe discovering an oversized boss. 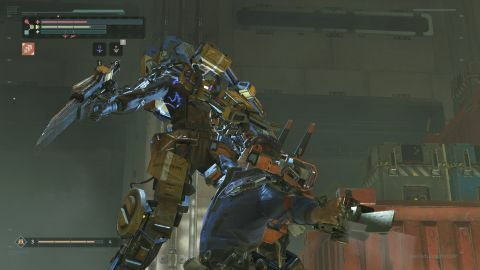 More likely I die and reappear back at Operations, leaving the scrap I collected—The Surge's equivalent of souls—where I fell. All the enemies respawn, so I try again, hoping to progress just a little further. It replicates the rhythm of Dark Souls, but is zippier and tougher than Lords of the Fallen. It replicates the rhythm of Dark Souls, but is zippier and tougher than Lords of the Fallen. There's a timer to retrieve scrap before it's gone forever, and the combat has body-part targeting and damage bonuses for hitting unarmored parts. However, if I wail on an armored limb long enough to build up the Energy meter I can sever it for an increased chance of getting that particular weapon or salvaging a bit of damaged armor that can be used in crafting or upgrading my own version. The reason specific parts need to be severed is because enemies melt on death as though their designs are protected by aggressive DRM, leaving only a few points of generic scrap. I target the body of someone whose chest armor I want, then hack them in half with my chainsword. Why doesn't their leg armor come off as well, since I've split them in half? It's very abstract, but the action isn't. There are vertical and horizontal attacks, suited for specific limbs, and sometimes a swing won't hit where I'm targeting because an arm got in the way. It's a mix of fussy realism and complete abstraction. It also feels like it was designed by someone staring at a whiteboard with RISK/REWARD MECHANIC written on it. Fighting robotic enemies gets boring, however. Against humanoid opponents the combat is fun, but drones are too small to have hit locations and the many legs of spidery robots confuse the system. Neither are as interesting as removing cyborg arms like you're debranching trees. It's definitely best against humanoid opponents, although awkwardly teleporting into position for a gory finishing animation can cause problems, especially when fighting on ledges or around toxic waste. Another way The Surge differs from Dark Souls: there's no multiplayer, meaning there are no invasions and it's pausable. It's also more melee-focused than Dark Souls. Warren is limited to hand-to-hand combat, which leaves his drone companion to provide ranged assistance. Mouse-and-keyboard controls work well when selecting limbs by scrolling the mouse wheel up and down, but leaping over and ducking under attacks by doing the same while holding Q to block is fiddly. One of the controller setups in the options is literally just the Dark Souls layout, if that's more your thing. The options menu is solid too, letting you specify when finishing animations play and whether there's slow-motion in combat. I recommend cranking brightness up. The other obvious difference between The Surge and Dark Souls is the sci-fi setting. Weapons and armor have chunky industrial design. Repurposed power tools, pipes, and lifting equipment make Warren look like he's wearing a miniature powerloader from Aliens. The industrial setting does the levels no favors though. Especially early on, it's all power plants and waste treatment facilities. Like Dark Souls you'll spend a long time in each zone, but it doesn't have that mix of glumness and grandeur, that sense of the mythic that makes the hard slog rewarding. The Surge is all steel and wire, like an explosion at the factory factory.